I Love My Amazing Animals: Happy Father's Day! Happy Father's Day my friends! This is a photo of my Dad riding his horse in the Berkshires, MA on August 14, 1983. 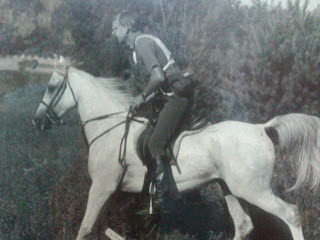 He loved to ride and to hunt! His greatest advise to me growing up was to not get angry fast and to not to worry, everything will be fine. True too, I still try to live by this today! Excellent advice from your Dad, and the photo is a wonderful memory to share. What a very cool picture!! Maybe this is where you got your love of animals from? What a great photo and very smart advice! Happy Father's day! Great advice! A lovely post on Father's Day. Oh, so nice! Happy father's day!!! !